Pleasantville, New York: The Reader's Digest Association, 1997. This Reader's Digest Mystery & Intrigue volume contains a condensed version of Tony Hillerman's The Fallen Man as well as versions of novels by Nevada Barr and Linda Barnes. The dust jacket is white and green. 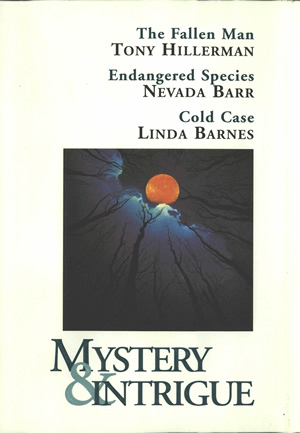 The front cover contains the titles and author names of the included works, an illustration of bare trees in a circle pointing inward and upward to an orange moon with white and blue clouds, and the words "Mystery & Intrigue" printed in green at the bottom. The back cover displays "Counterfeiting Ring: A Mini-Mystery," and barcode. The spine is printed in white on green and displays the Mystery & Intrigue imprint, a smaller version of the front cover illustration, author names and titles of the included works, and "Reader's Digest." The front flap of the dust jacket contains synopses of two of the included novels. The back flap contains synopsis of the third novel, notice of the next volume in the series, and cover illustration and printing credits. Binding: Dark grey paper cover with green cloth tape along spine. Front cover has "Mystery & Intrigue" embossed in silver. Lettered on spine in silver: "Mystery & Intrigue," author names and titles of condensed novels, and "Reader's Digest." Endpapers are speckled gray.